Both the Google Analytics & Google AdWords integrations report call data as “Conversions” in AdWords, but they operate differently and work to achieve separate goals. This integration will track calls from Visitors to your Landing Pages/Website as “Events” in Analytics. This popular integration allows you to view your calls right in Google Analytics and analyze them in conjunction with your website data. 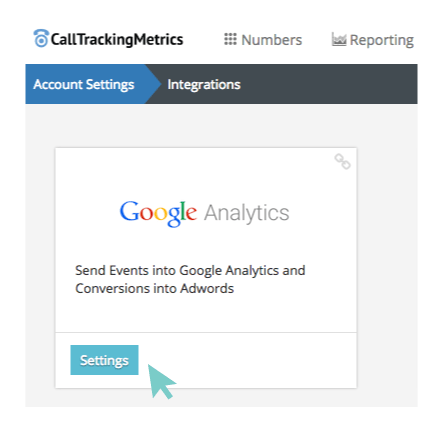 CallTrackingMetrics sends all inbound calls, inbound texts and FormReactor® submissions into Google Analytics as “Events” with the Website Visitor detail attached. Connecting Google Analytics to Google AdWords creates a seamless flow of data, connecting the exact “Paid Click” to the unique caller. Inside Analytics, “Goals” can be set up around “Call Events” and can be customized in a variety of ways. These Goal Completions can be imported into Google AdWords as a “Clicked Conversion”, helping improve your overall conversion rates. Google AdWords will only allow calls to be imported as a Conversion that can be tracked back to a “Paid Click.” Note that it takes up to 5 business days from the time your goals start completing in Analytics for the “Import from Google Analytics” option to appear in your AdWords account. 1. Go to Settings → Integrations. 3. Click the “Link your Analytics Account” button. In a separate browser, log into the Gmail account that has access to the Google Analytics property you’d like to connect to CallTrackingMetrics. 4. 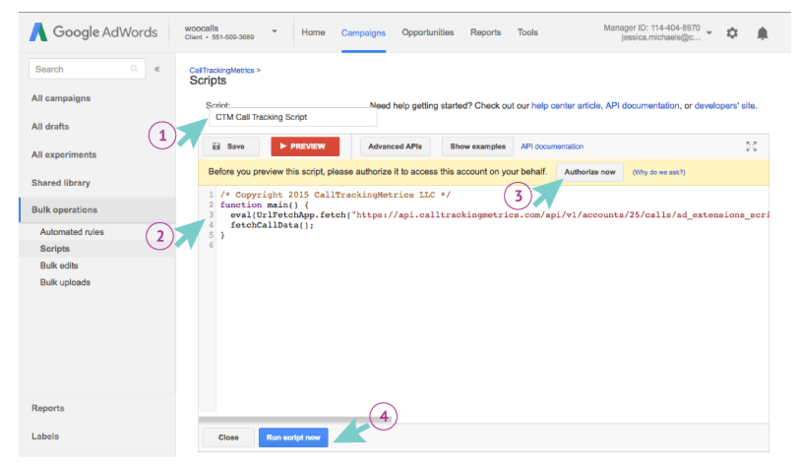 Allow CallTrackingMetrics access to the “Users UA Properties” by signing in to your Google Account. 5. Under Site Tracking, select the site that you wish to track from the dropdown menu. 6. Once a selection has been made, click the “Use Selected Profile” button. 7. Under the Google Events section, customize how you want the information to report using the toggle options. At this point all your inbound call and form data will report as Events inside of Google Analytics. Learn more about the data CTM sends into Analytics. Google Analytics & AdWords do not report in real time. Google Analytics & AdWords do not report in the same time. It typically takes between 5 minutes and 24 hours for paid campaign data to populate in the call log. CallTrackingMetrics tracking code must be installed on the page. Google Analytics tracking code must be installed on the page. Google Analytics must be linked/ communicating with Google AdWords. CallTrackingMetrics must be communicating with Google Analytics. If communication is broken in any of the three areas, the keyword data and conversions will not report. 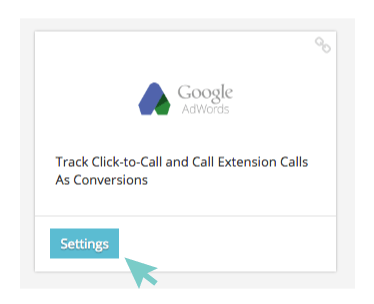 This integration will track calls to your click to call ads and call extensions back to the exact keyword and ad that led to the call. You will see this information in AdWords as phone conversions so you are not just optimizing around those people that clicked on the ads- but also the many mobile and desktop searchers who called right from the click to call ad or extensions. 3. Under “Linked Tracking Source” section, associate any Offsite Tracking Sources that you want us to track. 5. Once the tracking sources are activated, scroll to the “AdWords Script” at the bottom of the page. 7. Log into your Google AdWords account. 8. Go to Bulk Options → Scripts. 10. Name your script something easily identifiable. 11. Select All and Paste the CTM Script. 13. Select “Run Script Now and Close“. 14. Create a Schedule for the script to run hourly. 15. 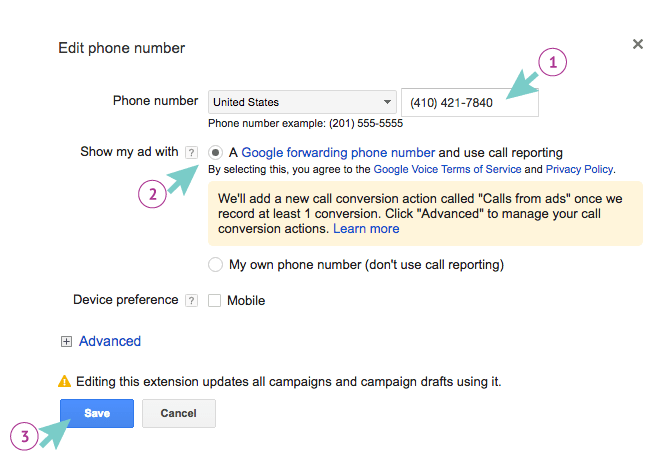 Set your “Ad Extensions” and “Call Only Ads” to use Google Reporting. Script must be scheduled to run hourly. Must use Google Reporting, this will use the Adwords does not always use a forwarding number but instead shows the assigned forwarding number. This can cause discrepancies in reporting. Google Forwarding Numbers must forward to CTM Tracking Number. Because the script is set to run hourly the campaign, ad group, and keyword data will appear in the call log after about an hour.